Howdy! My name is Beau and the one with her tongue sticking out is my silly sister Belle. 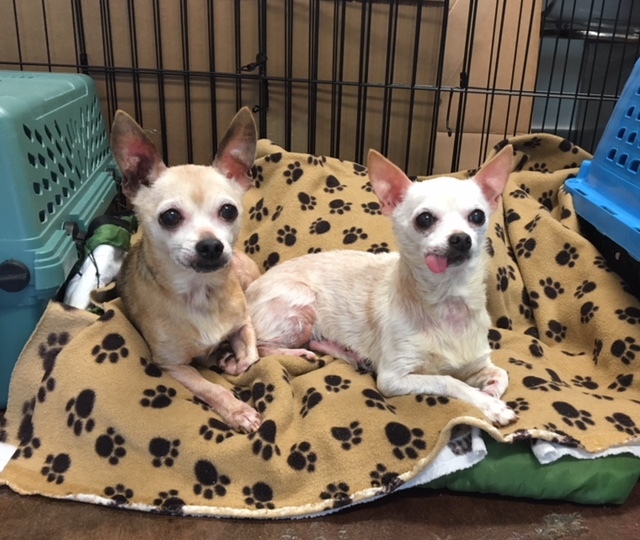 We are two chihuahuas looking for our forever homes together. At 12 years old, we are at the retirement age and looking for a nice quiet home to finally relax in, play some Bingo or Shuffleboard and get some yummy afternoon snacks! I can be a little bit shy at first, but once my sister takes the lead, she gives me a confidence boost and I am excited to meet you. We have spent many years surrounded by other animals, but we are ready to vacation and just have the spotlight be on us, so an adult only owned home without other dogs or cats is needed. We both came in rough shape but Pixie got us all better and we even are getting our dentals! Whether we are in a foster or our permanent home, we are ready for lots of attention and cuddles, while we make you laugh with our hilarious antics. We even still wrestle each other sometimes! She really is the best sister one could ask for. So fill out an application today and we can start our couch potato lifestyle together! Available for foster or adoption, we come with vaccines, micro-chips, spay & neuter, and dentals with an adoption fee of $300.